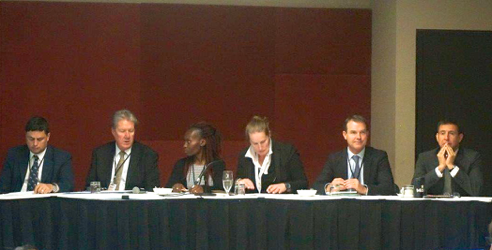 Johannesburg, 27 September 2016 – A powerful group of international agencies met this week in the margins of CITES #CoP17 to discuss how best to integrate law enforcement, development, environmental and social approaches to combating illegal wildlife trade. The first ever Global Partnerships Coordination Forum was convened by the International Consortium on Combating Wildlife Crime (ICCWC), a collaboration between the CITES Secretariat, INTERPOL, the United Nations Office on Drugs and Crime (UNODC), the World Bank and the World Customs Organization (WCO). The Global Partnerships Coordination Forum took place alongside the Conference of the Parties (or CoP17), where delegates will decide on trade controls affecting close to 500 species, including many plants and animals illegally trafficked across borders by international criminal syndicates. “Wildlife crime increasingly involves transnational criminal groups targeting high value species and wildlife and environment agencies cannot beat them alone. This Forum provided a unique opportunity for officials to directly engage with the organisations that have the mandate, resources and technical expertise to assist countries in combating wildlife crime,” said John E. Scanlon, Secretary-General of CITES. More than 80 delegates attended the high-level Forum, moderated by Valerie Hickey, Practice Manager of the World Bank Group’s Environment and Natural Resources Global Practice. Dr Hickey described the work of enforcement agencies as a “difficult and dangerous task,” adding that the CITES Secretariat had played an invaluable role in coordinating the Consortium that has in the past five years been critical to build formal links across the chain of interventions – from prevention to prosecution – that is necessary to combat wildlife crime. Leigh Winchell, Deputy Director, WCO Enforcement Sub-Directorate said that in many cases, the damage was often already done by the time customs’ officials opened containers at ports. “Solving a problem like this is not a simple enforcement issue. It is also an educational process and a social issue. We need to get people involved with the entire process,” he said, adding that it is important for customs officials, law enforcement authorities, and international organizations as well as their regional networks to be linked to the supply chain community and share valuable information about trafficking. “The bottom line is that we work together or we are not effective,” he said. Mr Jorge Rios, Chief, UNODC Global Programme for Combating Wildlife and Forest Crime told delegates: “The nexus between wildlife crime, organized crime and corruption is clear. If we treat wildlife crime as organized crime, cooperate closely, and act aggressively to the recover the proceeds of crime to ensure that criminals do not benefit from their illegal activities, we can reduce wildlife crime.” Mr Rios added that we need to reduce the risk of corruption in institutions tasked with managing wildlife and forest resources and enforce the relevant laws. Mr Nik Sekhran, Chief of Profession for Sustainable Development, United Nations Development Programme (UNDP), who joined ICCWC partners for the discussion, said that UNDP had put wildlife crime squarely on the development agenda. “Whatever entry point countries seek from us, we can make the connection with wildlife crime,” he said. Mr Sekhran warned of a “calamitous impact” if the world continued to lose its biodiversity at the current rate. He said it was essential for communities to have a utilitarian incentive in some form to protect wildlife. Mr Sekhran’s remarks raised the issue of disappearing livelihoods and development pathways for people who live with wildlife. The issue of livelihoods, including in relation to food security, is tabled for discussion at #CoP17. Delegates will also consider the establishment of a rural communities committee of the CoP, to better recognize that community-based natural resource management promotes sustainable use of wildlife, and reduces illegal use and illegal trade in wildlife. Ms. Leah Wanambwa Naess, Senior Policy Officer, speaking on behalf of Dr Janet Edeme Acting Director, Department of Rural Economy and Agriculture, African Union Commission (AU) explained the work of the AU in combatting wildlife crime, stressing the importance of raising awareness and raising the profile of illegal trade. Ms Wanambwa Naess highlighted the development of an African strategy on combating illegal exploitation of and illegal trade in wildlife. ”Political support to implement it is key,” she said. Since its inception in 2010, ICCWC partners have scaled up their collective efforts to ensure a more coordinated law enforcement response to wildlife crime, and the Consortium has developed vital tools and provided crucial services to support national authorities and enhance their capacity to combat illicit wildlife crime. ICCWC looks forward to responding to calls from Parties at the Forum for channelling additional and longer-term resources on the front lines of the fight against wildlife crime, putting communities at the center of that support, and developing economic models to show the financial burdens of wildlife crime in order to mobilize additional domestic and international resources to combat it. The Forum was convened thanks to generous funding provided to ICCWC by the United States of America. The chair’s summary report of the Global Partnerships Coordination Forum will be made available shortly as an Information Document to CoP17.